Thrilled to announce that thanks again to Niel Ringstad and Jeff Goldberg (Principal/Owner of The Audio Specialist), there’s new Phish available for downloading: April 8, 1990, and April 8, 1992. Jeff’s exploration of the work involved in releasing this material to you is detailed here, and it includes information on the equipment and software used to bring this music to the community for the first time in the highest quality possible under the circumstances. It’s a fascinating read, particularly given the damage to the April 8, 1992, tapes that Jeff spent many hours endeavoring to repair. If you have any questions for Jeff, or want to wish him a happy 40th birthday, don’t hesitate to email him through Phish.net (user @Jeff_Goldberg) or email him (jeff at audiospecialist.net). Phish.com has the band slightly misquoted a couple of times. After "Divided Sky," Trey says “That was called ‘Divided Sky,’ our first tune in Telluride in two years, so we’re pretty psyched. I hope you guys can all see Page back here… he’s another... behind the speaker... Page McConnell,” to which Mike responds “Come on by and take a look,” prompting laughter from Page. These tapes had physical damage to the actual magnetic material, which caused a high-frequency crackle on several songs. The crackle has been removed as best as possible without jeopardizing the integrity of the sound. Before "Sleeping Monkey," Trey says “Thank you. Well, I definitely see a lot of people who’ve seen us before, and people from the East Coast here tonight… and all these people. So when I say that this is definitely one of my favorite gigs of the whole tour, you’ll know that I don’t say that… it’s not the kind of thing I say every night, and I definitely mean it. This is a great gig; I really like it." 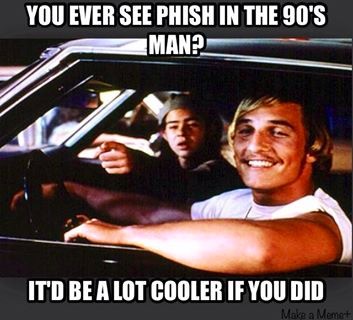 Happy Sunday to all Phish nerds too! Thanks Jeff! We appreciate your work. These just got added to "the spreadsheet"
The lord’s work! Thanks for the gifts! Thanks, Jeff! I wasn't aware any April '92 was uncirculated... 4/16/92 - 4/18/92 were some of my first B&Ps. Motive enough for me! Thanks very much and happy happy! Oh happy day!!!! Thank you so much, @Jeff_Goldberg for sharing the fruits of your hard work! The 4/8/92 Bowie is just off the charts good. Diverse improv, with an opening that's by turns playful and pretty, a long, tense, melodic minor key first jam segment, a long second jam segment that's funky with Mike playing a rather Foam-ish bass line, and then a quick pivot into an at-times weird weird but nevertheless fiery and satisfying closing jam. It should henceforward be recognized as one of the signature jams of Spring 92. Here is a picture of the 4-8-92 setlist I grabbed off on Pages organ on 4-12 (the next show). There was also one hanging off of Fishman's high hat. Underneath is the first set from 4-8. They were both written on the back of a sheet of paper, that appears to have all of Phish's songs categorized by Original or cover. They clearly strayed from the setlist. God bless the tapers ! El Rey! My favorite venue in my hometown. I just wish someone had slapped me on the back of my 15 year old head and told me to go see this show a year before I had even heard of Phish. D'oh! indeed. This Bowie needs to go up on the jam chart stat!